Wife kitteh and I are off on KT's Second Dixie Tour, otherwise known as The Great Confederate Livermush Adventure. Inspired by a desire to see Confederate Railroad in concert and a post on a Southern cooking blog that extolled the virtues of that North Carolina treat, livermush, we're back in the land of cotton for a week, having a grand old time. Because we're traveling so much, we decided to rent an RV from Cruise America instead of booking hotel rooms. Neither of us like to be told what to do, so hotels and cruises are pretty much out of the question. Instead, our first choice is always Vacation Rental By Owner, or VRBO for short. We pick a spot, get a condo or a house and then move in for a week. We're both good cooks, so we have more fun and better food when we don't go out to eat. With VRBO, you have total freedom to come and go as you please, eat in your bare feet and imbibe a bit more with dinner because you're not driving. The RV made sense this time because we're traveling so far. The map below gives our general path. Our fixed destinations were Nashville for the airport, Fayetteville for the concert and Asheville for the livermush. After that, it was all up for grabs. I looked at VRBO places in the Tennessee hill country around Ducktown, but as we've never been here, that was really a shot in the dark. Driving distances are great enough so that if you made a home base, there would be days with 6 hours of driving. Wife kitteh said, "Do not want!" and that was that. Neither of us have done RV camping before. We rented from Cruise America, a nationwide RV rental chain. 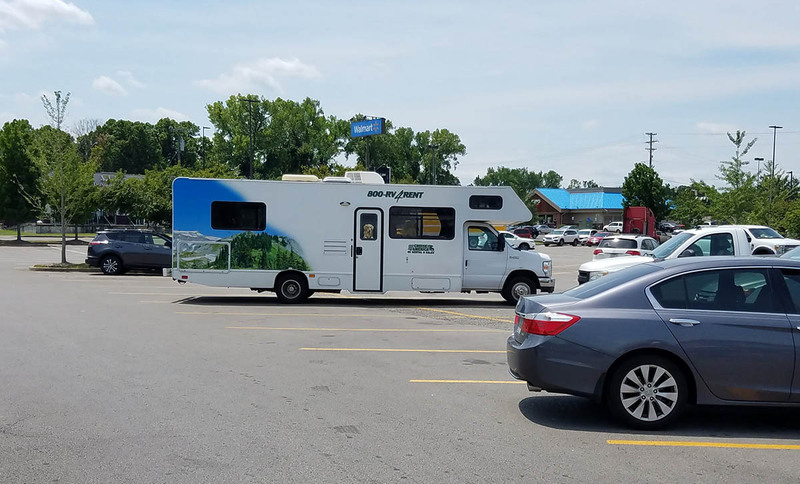 Wife kitteh wanted a big bed, so we got their large camper, a 30' beast, shown here in a Walmart parking lot in Nashville. "Honey, do you remember where we parked? Oh, right. It's the one the size of a barn." I'd driven U-Haul moving trucks before, but only the smallish ones. This behemoth was bigger than any of those. I read online in forums that you get used to it pretty quickly and they were right. I'm fairly comfortable with it now and it's only been a couple of days. Here are some other things we've learned. No packing and unpacking! Yay! All your stuff is with you. No need to waste time going to restaurants for breakfast and lunch. We've ended up going out for dinner, but one meal is better than three. If you stop at a store with a good liquor selection to stock up and then get dinner to go, you can still eat with your shoes off and have that extra beer or glass of wine in the RV once you get to your camping spot. Wife kitteh drinks wine and I drink beer, so we didn't need to find any hard liquor, just decent wine and local crafts. It's easier to drive than you might think. You're fine as long as you remember your turns are very wide and are careful backing up, using a spotter behind you. If we wanted to bring the Catican Guards on vacation with us, the RV would be the only way to go. Three dogs in an SUV is fine for 30 minutes, but longer than that and you'd all go mad. Plus, there'd be much less room for luggage. You feel trapped by the size of it. Parking takes at least 2, but realistically 4 slots, so you quickly start crossing desirable destinations off your list like hiking trail heads with small parking lots. It's not a VRBO house, it's an RV. It's nice enough, but it's not someone's house. Think one-and-a-half star motel, minus the vermin underfoot and the drug addicts staying in room next door. Cruise America will rent you a decent cooking kit, but you have to provide all the spices and stuff. VRBO houses usually have an adequate collection. The bed is a non-standard size. We got queen sheets and sheet corner clips to keep the bottom sheet on and it worked well enough. You camp where there are RV campsites. That means you may need to drive 30 minutes out of your way to get to your stop for the night. If you fly in and rent like we did, you buy things you wouldn't have to otherwise. We bought a cooler and beach chairs and a few other things as well. When we leave, we'll take the cooler with us, full of delicious livermush products, but the chairs and the rest will be donated to charity. We've been discussing RV camping as we've gone along. I'm not much of a fan, unless, like this trip, it's a scouting expedition. Now that we've been here and have a feel for the place, I'm a lot more confident picking a VRBO spot. We both have loved the hill country of Tennessee, so we'll be back, next time with a house or cabin in the woods.